Welcome to our Cross Breeze Screens Ventura website. We are a completely mobile Screen repair service. We repair and replace your window screens and screen doors in Ventura, Oxnard, Camarillo, Ojai, Santa Paula, Port Hueneme and Fillmore. We bring our custom, fully equipped screen trailer to you home and do your work at your house. No brick and mortar shop means lower over head for us and better prices for you! Screen and screen repair by Cross Breeze Screens Ventura, we are your premier mobile screen service company for Ventura and its surrounding communities of Ventura, Oxnard, Camarillo, Ojai, Santa Paula, Port Hueneme, Fillmore, providing some of the most important products and services required for every home owner in Ventura county. Screens play an important and necessary role in protecting the health and well being of residents in their Ventura County homes, apartments and buildings. Screen mesh that is a part your window screens, screen doors, sliding screen doors, security screen doors, pet screens and pet doors is there to guard your Ventura building from insect attack and the attack of flies, mosquitoes, moths and other insects capable of carrying disease in Ventura. Screens keep out insects, as well as leaves, twigs and debris that is carried by the wind. Screens allow cool and healthy breezes to come inside the building and filter out harmful UV rays from the sun, as well as large objects carried by the Mother Nature's wind. Cross Breeze Screens in Ventura is proud to present the following products and services. Screen repair Ventura to fix the holes in our current screens. Window screen repair Ventura to fix the holes in your current window screens. Screen door repair Ventura to fix the holes in your current screen doors. Pet Proof Screen Ventura is provided by Cross Breeze Screens. 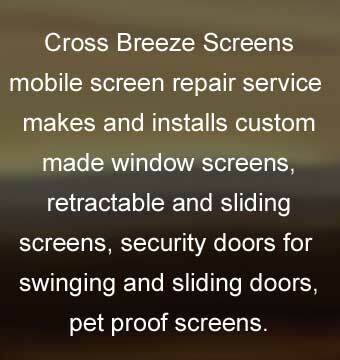 Cross Breeze Screens Ventura are your screen specialists who bring service and expertise to your home with our mobile screen repair. We are a local company, located in Ventura, operating within a 30 mile area, including Oxnard, Camarillo, Ojai, Santa Paula, Port Hueneme, Fillmore with our fully equipped trailer so we are able to complete the repair with one visit. We stand by our work and our products and are pleased to provide a consultation which can be arranged within a day or two of your call. We install window screens, sliding screen doors, swinging screen doors and retractable screen doors, pet doors, heavy duty screens and specialty screens. Ask us for more information about these, as well as our new Rollaway screen doors. We repair, replace or install screen doors and window screens. Your existing window screens in Ventura may develop small rips or tears within the screen itself or the frame may become bent over time. Cross Breeze Screens mobile trailer comes to you and is able to repair these as well as provide custom window screens when needed, all at an affordable price. On average we offer our customers a 10% savings over the competitors in your area. Home owners may wish to simply repair existing window screens or to have entirely new replacement screen doors or replacement screens added. Our pet screens Ventura are an exceptional addition to our mobile screen service and a valuable addition for any home with pets as well as those who “catch” the door in the center rather than on the frame. This is a specially designed vinyl coated polyester screen which is 7 times stronger than regular Ventura screens. Not only does our quick and efficient mobile screen service at Cross Breeze Screens set us apart from the competition, but our warranties do as well. We encourage our customers to ask us about any questions they might have as well as for a full explanation of the warranties we provide on products and service. Our Ventura business is built on a solid foundation of customer satisfaction and we consider word of mouth to be the best form of advertising. Window Screens Ventura wants to tell you about our mobile screen service. Cross Breeze Screens serving Ventura, Oxnard, Camarillo, Ojai, Santa Paula, Port Hueneme, Fillmore will fix your broken or ripped screens at your home with our Mobile Screen Service in Ventura. Cross Breeze Screens Ventura can easily repair your screens or screen doors at your home in Ventura. Cross Breeze Mobile Screen Service will come to your home or buisness with our custom built trailer to fix or replace your window screens or doors in Ventura, Oxnard, Camarillo, Ojai, Santa Paula, Port Hueneme and Fillmore. Remember Cross Breeze Screens when you are looking for screen doors or new or replacement window screens in Ventura, Oxnard, Camarillo, Ojai, Santa Paula, Port Hueneme, orFillmore Call Cross Breeze Screens for your entire window and door screen needs. Screens Ventura Cross Breeze Screens is your number one choice for your screen repairs and installations. Mobile Screen Service Ventura Crossbreeze has all of the service you will need Ventura screens stocks screen door parts and pet screen doors. Ventura Mobile Screen Services Include fixing and replacing your current screens and screen doors. Screens Ventura Cross Breeze Screens also will install and repair retractable screen doors. We have a full line of Guarda Security Doors and Security screen doors. Screens Ventura is a mobile screen repair service company located in Ventura. With our Mobile screen repair service we service Ventura Oxnard, Camarillo, Ojai, Santa Paula, Port Hueneme, Fillmore and the surrounding cities. When you think about Mobile Screen Repair you need to call screens Ventura Crossbreeze Screens. With oour mobile screen repair trailer we can fix or repair all of your screens onsite. We also offer new screens installation. Screens Ventura specializes in all types of screens, window screens and window screen repair, security screens, retractable screens. new screen doors and screen door repair. We also offer security screen doors from Gaurda Security door and security window screens. Screens Ventura services the city of Ventura and the surrounding cities of Oxnard, Camarillo, Ojai, Santa Paula, Port Hueneme, Fillmore. Call Ventura Screens Crossbreeze Screens and one of our professional technicians will take care of all of your screen needs. Yes it is heating up in Ventura. We have had a warmer then usual few weeks in Ventura County. Village. Spring time is here and as all of you know as it gets warmer in Ventura, Oxnard, Camarillo and Ojai the fly's and misquotes return. With the warm weather replacing and fixing your screen doors is a MUST. Let us at Cross Breeze Screens fix or replace your window screens in Ventura and Camarillo. Need to fix or replace a Screen door or retractable screen door in Oxnard or Ventura? Let us come to you with our mobile screen trailer and take care of all of your residential and business screens. Crossbreeze Screens Ventura wants our customers to understand we service many cities in Ventura County, California. Ventura, Oxnard, Camarillo, Port Hueneme, Point Mugu, Santa Paula, Fillmore, Oak View and Ojai. What makes Crossbreeze Screens Ventura the best mobile screen replacement company in Ventura, Camarillo and Oxnard? 1. Crossbreeze Screens come to your home or business in Ventura, Camarillo or Oxnard to fix or replace your window screens. 2. All of our window screens and screen doors are made from the highest quality materials to last. 3. Crossbreeze Screens Ventura is competitively priced because we come to you with our mobile screen trailer designed and built just for the mobile screening industry to fix all of your screen needs. 4. Crossbreeze Screens Ventura also installs Security Screen Doors from Guarda which are available in both sliding and traditional swinging screen doors in single doors and French door openings. 5. Crossbreeze Screens services Ventura, Oxnard, Camarillo, Port Hueneme, Point Mugu, Santa Paula, Fillmore, Oak View and Ojai in Ventura County. Crossbreeze Screens services all of Ventura and the surrounding cities of Camarillo and Oxnard with our mobile screen trailer. Yes we come to your home or business in Ventura and the surrounding cities of Camarillo and Oxnard. We make it simple for you. Why try to fix it yourself or bring your screens to a big box store? With our mobile screen trailer we make it easy and convenient to fix or replace your window screens and doors in Ventura and the surrounding cities of Oxnard and Camarillo. Do you need a pet proof screen? Crossbreeze Screens Ventura carries Phifer Pet Screen® mesh on our mobile trailer. Phifer is the best pet resistant screen mesh made in the USA. Phifer Pet Screen® mesh is seven times stronger than traditional insect screen mesh. It offers good outward visibility and resists damage by cat claws and dogs paws. The end of September is here and we are now enjoying cooler days in Ventura, Camarillo and Oxnard. We enjoy these perfect days which is why we live in Southern California. Crossbreeze Screens Ventura is available to help you enjoy this time of year as the hot summer weather is no more. The summer was rather warm in Ventura, Camarillo and Oxnard. It was a hot one this year with a few weeks really bad. We all enjoy opening the windows in Ventura, Camarillo and Oxnard. Letting the calm breezes into our homes are what we enjoy. To help you enjoy this weather Crossbreeze Screens services all of Ventura, Camarillo and Oxnard and the surrounding areas with our mobile screen trailer. We will come out to your home and fix or replace all or any of your screens in Ventura, Camarillo and Oxnard and the surrounding areas. At Crossbreeze Screens Ventura we get a lot of customer calls from all over Ventura county. Crossbreeze Screens services all of Ventura, Camarillo and Oxnard and the surrounding areas with our mobile screen trailer. We will come out to your home and fix or replace all or any of your screens. In Camarillo we service all of the zip codes 93010, 93011. 93012. We wanted to make sure that anyone that lives in Camarillo California we are always ready to take are of all of your screen replacement needs. As the Hills Fire and Woolsey fire raged, our thoughts go out to all those who had to endure this traumatic event in Ventura and Los Angeles County. Crossbreeze Screens Ventura will be returning to service to everyone including the areas effected by the fire. With 2018 winding down, Crossbreeze Screens Ventura, would like to thank all of our great clients for a spectacular year. What makes Crossbreeze Screens Ventura so popular is the referrals and 5 star reviews we receive from our fateful customers in Ventura, Oxnard, and Camarillo. We are looking forward to a banner year in 2019. Enjoy your holidays and help us bring in 2019 with another prosperous year in Ventura, Oxnard, and Camarillo. 2019 is here and its time to do maintenance on your home or business. If you live in Ventura, Oxnard or Camarillo Crossbreeze Screens will come to your home or business to fixed or replace your damaged window screens. We ask you to take a moment and look at your window screens to see if they need to be fixed or replaced. Crossbreeze Screens will come to your business or home in Ventura, Camarillo or Oxnard with our mobile screen trailer and take care of all of your repairs. Crossbreeze screens Ventura will take care of all of your repairs or installations professionally and quickly. February is one of the rainiest in Ventura county in years. We are all ready for spring to arrive in Ventura, Oxnard, and Camarillo accompanied by nice warm weather. If you are ready for that warm weather in Ventura as we are, it would be a good time to think about changing out your broken and or damaged window screens. Crossbreeze Screens Ventura is ready to come to your home or business to replace or repair your damaged window screens. If you live in Ventura or the surrounding cities in Ventura County, Crossbreeze screens Ventura will come to your home or business with there mobile screen trailer for a professional and quick installation. As you prepare for spring you might also consider the installation of our Phifer pet proof screen mesh that safeguards your screens from tears and punctures caused by cats and dogs. It finally happened. We've been waiting for this to happen a long time. In Ventura and Ventura County area we hit over 70 degrees. These new temperatures are happening in most of Southern California. What does that mean to you if you live in Vetura, Oxnard or Camarillo? You can open your windows and enjoy the nice weather and cool breezes. You open the windows and you ask yourself what do I do to fix those ugly screens that need repair or replacement. Call Crossbreeze screens Ventura. We service all of the surrounding cities of Oxnard, Camarillo, Port Hueneme, Santa Paula, Ojai and Fillmore. We will bring our custom screen trailer to your home or business in Ventura, Ventura County to fix or replace your window screens. Its mid-April, its warm and I just opened my windows in Ventura to let in the warm beautiful air and my screens are old broken and look terrible. I am Calling Crossbreeze Screen in Ventura to come and replace my worn out broken ugly damaged screens with beautiful new ones.